Cesare Zavattini, that motivating force in all seasons of new ideas for the Italian cinema, tried to exploit the formula of the episode film for several films half-way between the inquiry and the documentary. 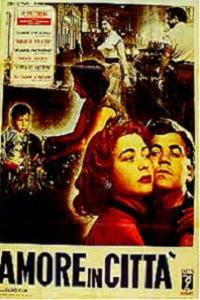 AMORE IN CITTA (LOVE IN THE CITY) was the first in a series and the intention of continuing it was apparent in the sub-title, Rivisita cinematografica n. 1 (Film Review No. 1). Taking the common theme of love in its various accepted meanings and nuances, a group of new directors was supposed to "explore" the emotions of a city, Rome of course. What happened instead was that each one went his seperate way, some undertaking an authentic inquiry, others telling a completely invented story, still others simply going through the streets armed with a motion-picture camera. The latter was the case with Alberto Lattuada in the episode Gli Italiani si voltano (Italians Turn To Look), a sort of "cinema-verite" exercise which catches the reactions of Roman males when a beautiful girl passes by. Un'agenzi matrimoniale (A Matrimonial Agency), an episode entirely constructed in the studio with unknown actors, was a "fake inquiry" conducted by Federico Fellini in the sad, shoddy world of those agencies which arrange (or try to arrange) marriages between shy and lonely people. This is the first indication of that "fictional" cinema, with the appearances of a documentary, that Fellini would later develop in I CLOWNS (THE CLOWNS), ROMA (ROME) and PROVA D'ORCHESTRA (ORCHESTRA REHEARSAL). But the best episode was Paradiso per quattro ore (Paradise For Four Hours) which revealed the talents of Dino Risi as a fond and ironic observer of the common people who spend their Saturdays at a "balera" (a popular dance hall which has nothing to do with the luxury of a night club or the rowdy modernity of the discotheque).